Wealth, and its public display, was probably used to establish status in early Anglo-Saxon society much as it is today. The purse lid from Sutton Hoo is the richest of its kind yet found. The lid was made to cover a leather pouch containing gold coins. It hung by three hinged straps from the waist belt, and was fastened by a gold buckle. The lid had totally decayed but was probably made of whalebone—a precious material in early Anglo-Saxon England. Seven gold, garnet cloisonné and millefiori glass plaques were set into it. These are made with a combination of very large garnets and small ones, deliberately used to pick out details of the imagery. This combination could link the purse-lid and the fine shoulder clasps, which were also found in the ship burial, to the workshop of a single master-craftsman. It is possible that he made the entire suite of gold and garnet fittings discovered in Mound 1 as a single commission. The plaques include twinned images of a bird-of-prey swooping on a duck-like bird (above), and a man standing heroically between two beasts. 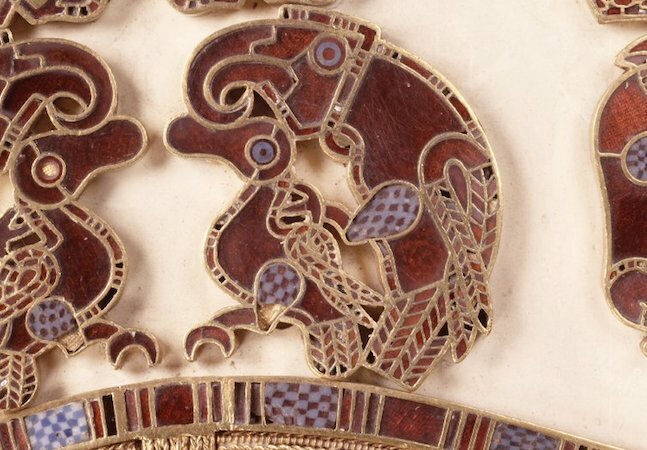 These images must have had deep significance for the Anglo-Saxons, but it is impossible for us to interpret them. The fierce creatures are perhaps a powerful evocation of strength and courage, qualities that a successful leader of men must possess. Strikingly similar images of a man between beasts are known from Scandinavia. 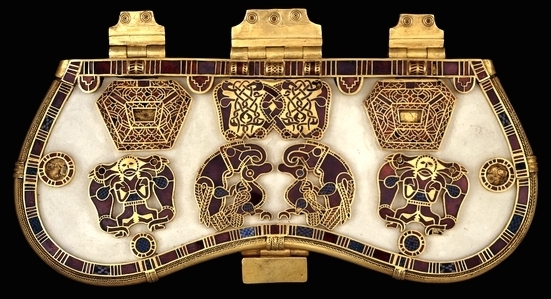 G. Williams, Treasures from Sutton Hoo, (London, British Museum Press, 2011). A.C. Evans, The Sutton Hoo ship burial, revised edition (London, The British Museum Press, 1994). R.L.S. Bruce-Mitford, The Sutton Hoo ship burial, vol. 2: arms, armour and regalia (London, The British Museum Press, 1978). Cite this page as: The British Museum, "The Sutton Hoo purse lid," in Smarthistory, March 3, 2017, accessed April 24, 2019, https://smarthistory.org/the-sutton-hoo-purse-lid/.